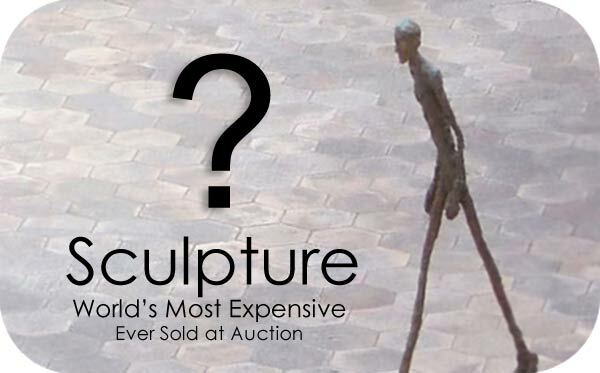 So What’s The Most Expensive Sculpture Ever Sold at Auction? We’ve seen those world-class auctions held on tv. Sotheby’s and Christie’s among other big names are some of the institutions pioneering a love for art as valuable pieces of luxury collections. Today let’s look at sculpture as one of the media next in line for the throne of art luxury. “L’Homme qui marche I” or “The Walking Man” by Alberto Giacometti fetched an entire sum of US$103.7 million at London’s Sotheby’s auction. The piece, a distinctive image of a stylized walking man was one out of a series of sculptures in similar form and art by Giacometti. Sometimes we in the artworld marvel at the deepest colors and the most innovative media, and yet I believe pieces like this emphasize an important intrinsic value that is often overlooked in art. The most prominently valuable characteristic that an artwork holds is its history. Giacometti was a brilliant scuptor and a timeless artisan. His works command prices higher than most of us can every dream of having, yet these seemingly simplistic designs of art may not always look like the most valuable things in the world. Historical significance of a piece to both the artist and his audience… -that is the value factor we have to look for when investing in artworks. Lily Safra, the buyer of the recently auctioned piece must have seen this quality in the work. Her record breaking piece is now an emblem of the personal and monetary value achievable by the medium of sculpture. Would you guys like to know about the most expensive painting ever sold at auction? It’s Van Gogh’s “Portrait of Dr. Gachett” that was purchased in 1990. Today the equivalent of the price paid for that work would be approximately just over 138 million US dollars. Despite this high number, it is not the most expensive painting in the world when judged purely by monetary data. A painting entitled No. 5 by the famed abstractionist Jackson Pollock in 1948 sold for about 150 million dollars (present-day equivalent). This transaction was private though, not at an auction.